It was the first time Master had given a lecture in Russia and the fellow initiates were delighted. They made every effort to spread the good news. The warmhearted local residents also helped to distribute leaflets. Master's coming brightened the city of Moscow. The lecture was held at the Meridian Culture Center, a splendid, modern building. 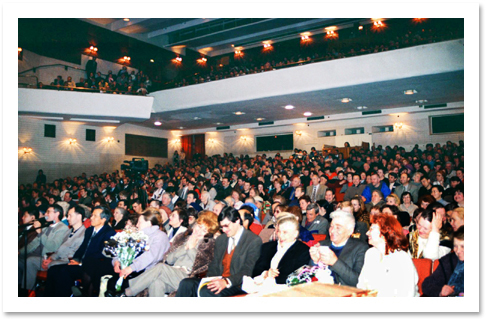 On the evening of the lecture wave after wave of people arrived and packed the spacious venue, evidencing the great interest of the people of Moscow in spiritual development. In Her lecture, Master said: "God has given me the duty to come to remind my brothers and sisters, to help you to reconnect yourself with your great Father, with our Father." "In order to find Hirm, we have to go step by step upward, not remain here, and not go down. I am here to show you how to go up. I will show you the stairs but you must walk by yourselves." "There is so much suffering, so much war, so much famine, so much disaster in the world and God suffers too. Hes wants Hiers children to be happy. Hes wants Hiers children to make use of the power that Hes has bestowed on them, but that they have all forgotten." In the question and answer session after Her talk, Master said: "As you can see, our world is progressing very quickly right now. In just a few short decades, everything has sped up very fast and a spiritual atmosphere is pervading the whole planet. More and more people are practicing real meditation, and vegetarians are everywhere. So you can see that the world is going to get better and better, nearer to the golden age. And in the year 3000, no one will eat meat anymore. Everyone will be vegetarian. Everyone will be a saint." 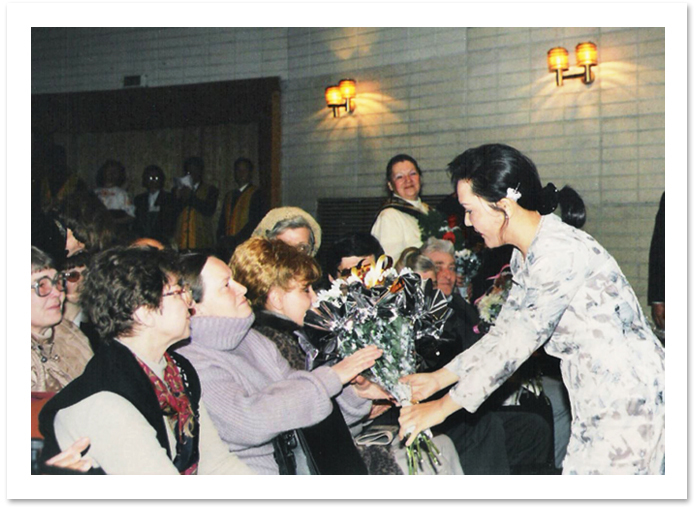 Right after the lecture, many people decided to request initiation into the Quan Yin Method. Looking upon their sincere faces and glittering eyes, the Quan Yin messenger asked them whether they could adhere to a vegetarian diet. They all gave affirmative replies. One twelve-year-old boy from China also wanted to be initiated. It was explained to him that, at his age, he could only receive initiation if he had an initiated parent to look after him in his meditation. So he dragged his mother by her hand, urging her: "Mom! Fill out the initiation form quickly! Fill it out now!" At the beginning his mother hesitated about undertaking a life-long purely vegetarian diet. But, seeing her son's earnestness, she finally filled out the form. Afterwards, the two of them came together to group meditation. Even though the child was of a young age, he knew he wanted to be a vegetarian and take up spiritual practice. This impressed us and convinced us that God dwelling within us has nothing to do with our age. During the initiation, everyone had good experiences. Some saw inner light and beautiful scenery in the heavens. Some described excitedly the splendid inner realms of God. Everyone was in bliss and completely assured. Master also came to give some explanations and lead us in reciting the Holy Names. A solemn and loving atmosphere pervaded the room, making both old and new initiates feel greatly moved and highly elated. Some kept shedding tears and staring at Master unblinkingly. Looking at the new fellow initiates who had just started off on their journey back to the Kingdom of God, we felt hugely rewarded for all our hard work and prepared for greater tasks ahead. Master embraced every one of the staff members. We all felt Her tender and infinite love. The lecture had ended as many began their spiritual journeys. May God bless and protect these sincere souls, bestow the glory, love and peace of Heaven upon the people of Earth, and make the Earth a paradise.